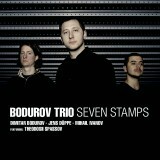 With their new album Seven Stamps, Bodurov Trio continue delving into Bulgarian folklore and further narrowing their search to the intrinsic variations of the very popular rhythm in 7. Different regions have their own interpretation and names of it such as Rychenica, Chetvorno, Elenino Horo, etc. In combination with other measures, the rhythm in seven, serves as a basis for other so called additive measures, which provide countless possibilities for interpretation. The trio will be also joined by the internationally acclaimed Theodosii Spassov (kaval), who is one of the pioneers in connecting Bulgarian Folklore with the jazz tradition, as well as a great inspiration for many musicians.